Elsa studied philosophy in her early years and worked as a scriptwriter in the US not realizing were her path would take her, moving to Paris in the late 1920s to open a boutique called Pour le Sport. She established a house of couture in Paris that was open from the late 1920s through the mid 1950s and established her New York showroom in 1949. She was the first to use synthetic fabrics, zipper fastenings and the first to open a boutique of ready-to-wear clothing. A daring, flamboyant fashion innovator, she popularized brilliant colors, especially shocking pink, which is in her trademark signature, boxes, paper wrapping and ice blue both colors that were shocking for there time but fully welcomed by all woman. 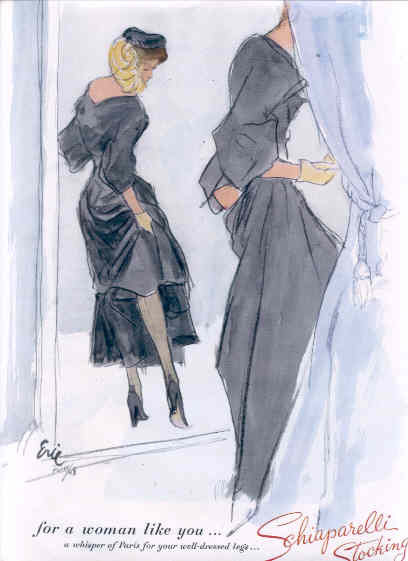 She is noted for her perfume, wide-shouldered suits and dresses, Woman’s hats, turbans, walking coats, evening sweaters, halter necklines, cocktail dresses with matching jackets, Stockings and scarves. She added innovative accessories to her garments, including shoulder pads, zippers, jewelry and unusual buttons. Schiaparelli 's flamboyant accessories, such as Feathered Hats, fish buttons, fox head gloves, and newspaper-print scarves, were just the right touch for the last frivolous, decadent years before World War 11. Schiaparelli also had a personal interest in her clients, often trying to help them find the clothes best suited to them. she believed that clothes should fit one's life-style. When the Depression put an end to frivolity, it also ended the Flapper Look. The waist returned to its normal position and skirts fell below the knee. In addition, Schiaparelli moved the center of interest to the shoulders, which she began to widen, accentuating them by pleats, padding, or braid—a silhouette that remained popular through World War II. Often called hard chic, her designs were smart rather than pretty. Schiaparelli used the bias cut for dresses, giving them a sensuous, clinging look that showed off the female figure. Very photogenic because of their bold statements, her designs dominated the fashion magazines. Schiaparelli not only set acceptance of Innovated designs she also set the standard for Quality in that all her pieces used only the best material available. Her products were of the highest standard and most manufactures would try to duplicate them. As well as her new products All of her vintage wears are still sort today including Jewelry, Perfume bottles, Stockings, Hats and almost anything she made.